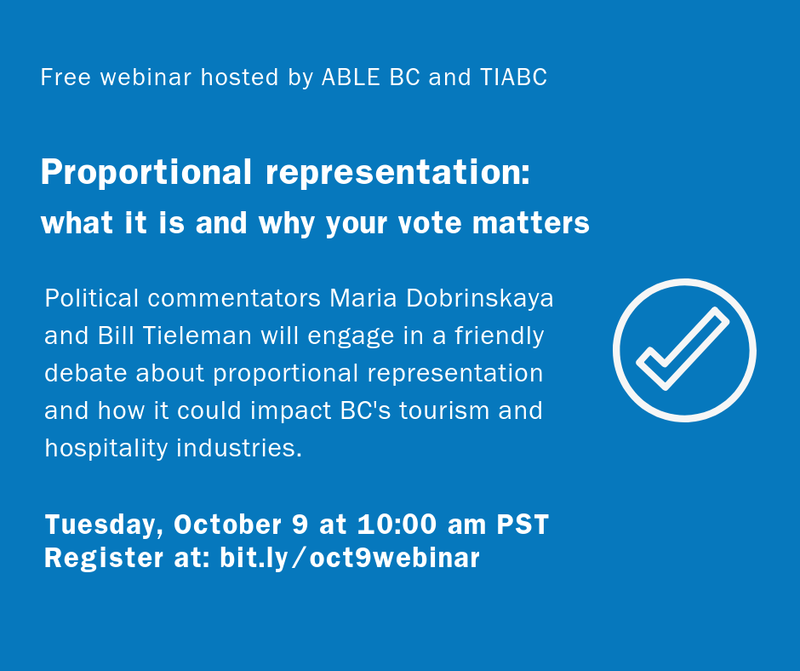 Join TIABC and ABLE BC for a free webinar to learn what proportional representation is and why your vote matters this fall. Guest speakers Maria Dobrinskaya and Bill Tieleman will engage in a friendly debate about proportional representation and how it could impact BC's tourism and hospitality industries. During the 2017 provincial election, the BCNDP actively campaigned for an electoral reform. They are now fulfilling this election commitment. Between October 22 and November 30, 2018, a referendum on electoral reform will take place by postal ballot in British Columbia. Voters will be asked what electoral system should be used to determine election results – the existing first-past-the-post system or a proportional representation system (PR); and what type of proportional voting system should be used, if PR is chosen.